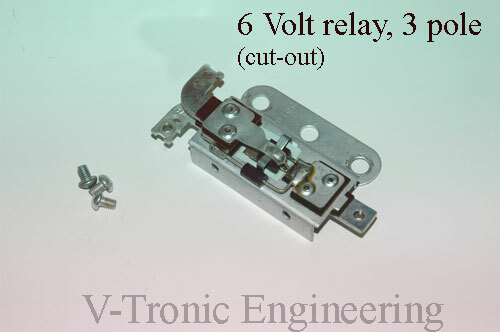 This model relay replaces the original cut-out found on the 6 Volt Harleys(74750-38 ;old nr. 4785-38) It works with the 6 Volt generator using the three brush system. It fits models: WLA, WLC, WL, Panhead and Knucklehead 1938-1957. The 6 Volt generator carries a copper or zink name tag “Model 32E” . It fits directly at the original mounting place without the need of changing any wiring. We produce this relay already now for more than 15 years. The old Delco Remy cover can be used on this relay, as well as the aftermarket cover.